If you take the following simple steps, you can successfully store down duvets in your vacuum storage bags. Of course, the following tips are for use at your own risk, but many people use vacuum storage bags safely with their down and feather products using this simple advice. Like all vacuum storage bag brands, we don't recommend storing feather duvets or goosedown in vacuum storage bags. In fact, our instructions specifically say not to, which occasionally gives rise to an email from a customer asking why not. Let's take a look at why you may not want to and then explain how (at your own risk!) to actually use vacuum bags for goose down or feathers while minimising the risk of damaging the duvet. If after reading our guide you decide against risking storing your feather or goose down in a vacuum bag, then Neusu has a whole range of duvet and bedding storage bags which don't compress your duvet, and offer capacities up to 200 Litres, more than enough for multiple duvets. You'll find links to buying them on Amazon at the bottom of this page. Why can't I use a vacuum storage bag for feather or down bedding? Feathers - this is quite simple. Full feathers have quills that are brittle and if you compact them with a vacuum, some of the quills will snap, leaving quite a lumpy duvet. If your feather duvet is quite old, this may have happened over time anyway, so it may not bother you. Down - goose down or eiderdown is different from feather. Down comes from the underside of the bird and is very soft and doesn't have hard quills. The problem with reducing a down duvet is not that it breaks, but that the down works because the tiny feathers capture the air between them to create the insulation. It's why the bedding is so light and fluffy yet warm. If you vacuum them, you squash them all together and even if you shake it out fully when you take it back out, it is likely to be less effective than originally. As these types of bedding are quite expensive, it would be a shame to ruin it. You can make use of vacuum storage bags for down duvets like this if you are careful. Having said why you shouldn't use vacuum storage for down and feather, we're now going to tell you how you can do it anyway, as long as you understand that this is at you own risk, and you've read what can happen to the duvets. Pack the bedding into a suitably large vacuum storage bag. Seal it properly and check the zip is fully sealed as normal. Attach the vacuum cleaner to the valve and start removing the air. Pat the bag as you do it to ensure the bedding is packing down evenly. Do not remove all the air. Stop removing the air when the duvet is reduced down in size, but before it has been compacted to the point that the down is being compressed or quills broken. This means leaving in 20-30% of the air. You should determine how much air exactly to remove on a case by case basis. So, rather than take all the air out at once, do it in small steps, checking the bag and contents as you go to ensure that you don't overdo it. You will still have a significantly reduced size and an easy way to store the duvets, but you shouldn't have done any damage to the bedding. When you take the duvet back out, ensure you fully shake it to get the air back in and re-ventilate the down. Decided against storing your feather duvet in a vacuum bag? 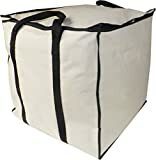 This is by no means the full range of bedding storage bags that Neusu makes (we have dozens of sizes/colours/styles), but you can browse the full range and purchase here on Amazon.co.uk as well as see how well liked they are by our customers.